Army Blimp Secured After Drifting Loose Over Pa.
An unmanned Army surveillance blimp broke loose from its mooring in Maryland and floated over Pennsylvania for hours Wednesday with two fighter jets on its tail, triggering blackouts across the countryside as it dragged its tether across power lines. 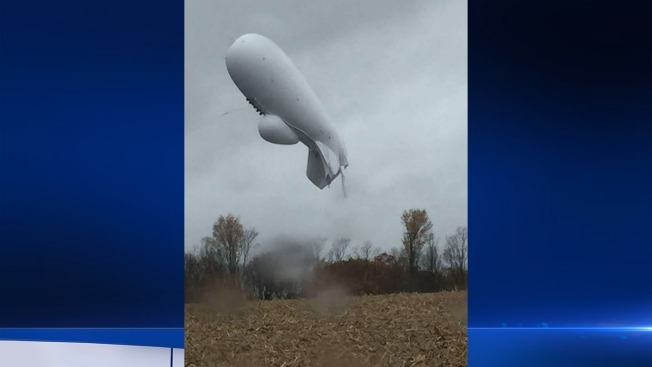 The bulbous, 240-foot helium-filled blimp eventually came down in at least two pieces near Muncy, a small town about 80 miles north of Harrisburg, as people gawked in wonder and disbelief at the big, white, slow-moving craft. No injuries were reported. Fitted with sensitive defense technology, the radar-equipped blimp escaped from the military's Aberdeen Proving Ground around 12:20 p.m. and drifted northward, climbing to about 16,000 feet, authorities said. It covered approximately 150 miles over about 3½ hours. As it floated away, aviation officials feared it would endanger air traffic, and two F-16s were scrambled from a National Guard base in New Jersey to track it. But there was never any intention of shooting it down, said Navy Capt. Scott Miller, a spokesman for the nation's air defense command. The blimp — which cannot be steered remotely — eventually deflated and settled back to Earth on its own, according to Miller. He said there was an auto-deflate device aboard, but it was not deliberately activated, and it is unclear why the craft went limp. He said it was also unknown how the blimp broke loose, and an investigation was under way. Residents watched it float silently over the sparsely populated area, its dangling tether taking out power lines. Tiffany Slusser Hartkorn saw it fly over her neighborhood on the outskirts of Bloomsburg around 2:15 p.m. and soon disappear from sight. "I honestly was worried that there were people in it that would be injured. A neighbor down the road is thinking it knocked down a tree branch and power pole by his house that could've potentially destroyed his house," Hartkorn said. Wendy Schafer's first thought upon seeing the blimp near her job at a spa and salon in Bloomsburg was that a nearby school was conducting an experiment. "I had no idea what it was. We lost power at work, so I looked outside and saw the blimp," Schafer said. "My first thought was Vo-Tech was doing something at the school until my friends tagged on Facebook about the blimp. It was crazy." About 27,000 customers in two counties were left without power, according to electric utility PPL, and Bloomsburg University canceled classes because of the outage. Electricity was restored to most people within a few hours. The craft even knocked out power to the State Police barracks at Bloomsburg before settling in a wooded hollow, where it was swiftly cordoned off while military personnel began arriving to retrieve it, State Police Capt. David Young said. He said trees will probably have to be cut down to get it out. Miller, the spokesman for the North American Aerospace Defense Command, said the tail portion broke off and hit the ground about a quarter-mile from the main section. The craft is known as a Joint Land Attack Cruise Missile Defense Elevated Netted Sensor System, or JLENS, and can be used to detect hostile missiles and aircraft. Such blimps have been used extensively in the Iraq and Afghanistan wars to provide radar surveillance around U.S. bases and other sensitive sites. The craft has a squat body, large fins and a rounded protrusion on its belly. When in use, it is tethered to the ground, unmanned, like a balloon on a string, its cable carrying power up to the blimp and sending data back down to a computer. It can reach as high as 10,000 feet, according to its maker, Raytheon Co.
"My understanding is, from having seen these break loose in Afghanistan on a number of occasions, we could get it to descend and then we'll recover it and put it back up," Defense Secretary Ash Carter said at the Pentagon as the journey unfolded. "This happens in bad weather." Raytheon referred questions to the military. But on its website, the defense contractor said the chances of the tether breaking are very small because it is made of a durable synthetic fiber and has withstood storms of more than 115 mph. The blimp was operating at the Aberdeen Proving Ground as part of a test of the systems that defend the nation's capital against airborne attack. The loss of the blimp has not weakened those defenses, Miller said. Jason Jarinko, a teacher at Central Columbia High School in Bloomsburg, said he was alerted to the blimp by a student who was gazing out the window just before the start of a class. "We just kind of scoffed that he had seen a bird or something, and he said, 'No, look!' and it was this blimp coming at us from the east," Jarinko said. He said students gathered in disbelief as it passed over at maybe 200 to 300 feet. "As it got closer to us, all of a sudden our lights started to flicker and we lost power," he said. "At first, we didn't realize the two events were related."